As we count down the days to Thanksgiving, planning meals and menus, scheduling get-togethers and parties, looking forward to some time off and some family time together, we want to bless one of our amazing readers with a little gift package token of thanks in this holiday giveaway. We are excited to partners with quite a few other bloggers on this giveaway as well, so please be sure to check out their giveaways in the linkup below after entering our giveaway. If you’re busily preparing for hosting Thanksgiving at your house or are trying to decide on which dish to take for a potluck dinner at a friend or family member’s home, take a moment to download our Thanksgiving Dinner Planning Guide – complete with make-ahead ideas and tips, fabulous recipes, and tips for less stress on the special day. 1. A beautiful bamboo Dish Dish cutting board (perfectly sized for handy chopping, prepping, as well as easy cleaning and storage). 2. 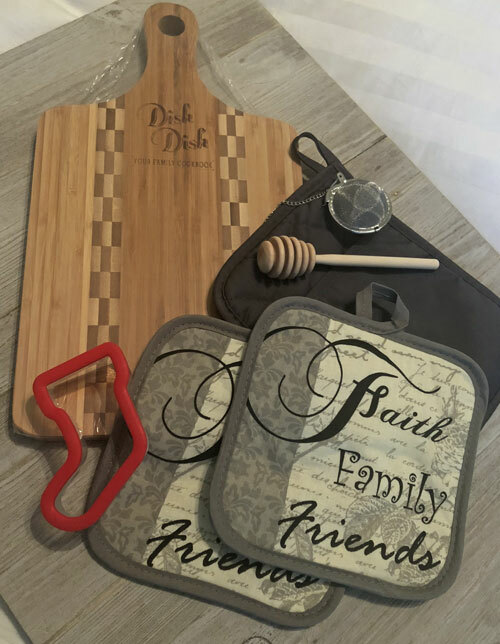 Two decorative potholders with the Faith, Family, Friends sentiment as well as a pocketed gray potholder for heavy-duty lifting in the kitchen. 3. One honey drizzler – because everyone needs one for enjoying their favorite cup of tea or drizzling honey over breakfast biscuits. 4. One tea diffuser – diffuse your favorite tea blend into a mug of hot water these cold wintry mornings and savor life. 5. Just for fun – a cute stocking cookie cutter (perfect for making fun holiday cookies or as a holiday package decoration).